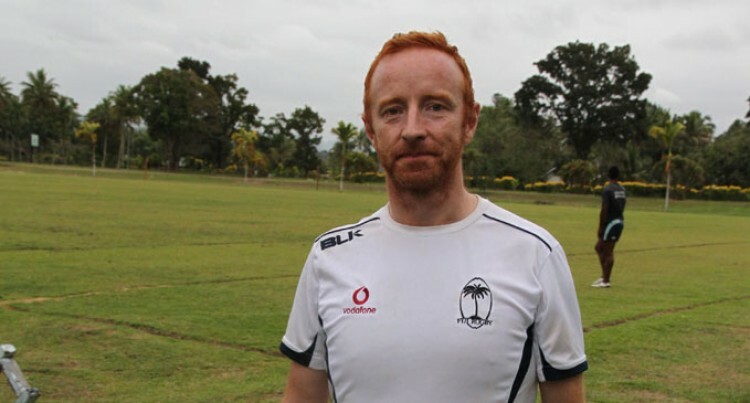 Vodafone Fiji 7s coach Ben Ryan aims to score a first back-to-back win for Fiji on the 2014-15 HSBC Sevens World Series which starts in Gold Coast, Australia next month. Ryan had his first training session with the national 7s squad at the Uprising Beach Resort yesterday and took time out to reveal lessons learned and plan for the future. SUNsports: It’s been one year now. What has been your experience? Ben: Where do we start? I’ve had three Fiji Rugby Union CEOs already in one year. Off the field, a lot has happened. But if think last year before Gold Coast, I only came three days before the tournament. Now I’ve got three to four weeks at the most but I’m as excited as I was on Day One. SUNsports: What have been the highlights so far? I know Dubai was one. Ben: Probably, if I’m honest with you, the very first training session. You know, when I got in the field and I was the Fiji coach. Yeah. The very first time I got to coach the boys. I think on the field it was the 44-0 semi-final against New Zealand. So yeah, that was an amazing time. SUNsports: What is it that you could have done better in the past year? Ben: Some of the really narrow defeats, particularly to New Zealand in the last two semifinals in London and Glasgow, I really think we could have been clever in the last few minutes to have won both of those games in very small margins. If we’d beaten them, we would have won the finals I think. So, you know, some cleverer decision-making perhaps. One or two things and we could have won four instead of two titles this year. SUNsports: we won two tournaments in the last series, Japan and Dubai. We came third, and this is a difficult year for you, to get into the top four to be able to qualify for the Olympics. So we have you got a tough year ahead? Ben: We have I’m sure. You’re right. It’s a difficult year for us because particularly Australia has put a lot of money into their programme for the season and they were outside the top four. England I know has lots of money. Samoa has got a new coach now and South Africa and New Zealand and us. It’s going to be a tough year but everyone is going to be worried about Fiji. We have another year together and I’ve kept the squad mostly. We’ve lost Samisoni Virviri, Donasio Ratubuli and Benito Masilevu, but we’ve also got other boys that have come back that have been away so it’s going to be a tough year. But, I’m also pretty excited. SUNsports: why do you think we’ve been hot and cold throughout the series? Is it conditioning, training or something else? Ben: I think we’ve been very consistent. Only New Zealand has a better tournament consistency against us. So if you look at South Africa who came second, in the nine tournaments that were held last year, we were better in five tournaments than South Africa. They were only better us in four. Everybody would say South Africa were very consistent. But we have a winning record against them. We lost less games than them. So I think our consistency is better. Every time we lost a quarterfinal, we won the Plate. We’ve won a Trophy in every tournament. I think we were very consistent last year. SUNsports: This squad will be contracted. How many have you signed so far? Ben: Just one. Just Osea Kolinisau. Hopefully we’ll have a couple more by the end of the week. I’ve offered contracts to Pio Tuwai and Waisea Nacuqu. I’m talking to the Fiji Navy for Emosi Mulevoro and there’ll be a few more. So they need to earn their contracts over the next few weeks. But I think when we get to Dubai, we’ll see that most of the boys will be contracted. Oh, it’ll be great thing. The boys deserve it and they’ll work even harder. SUNsports: you’re looking forward to the Gold Coast? Ben: Very much so. It’s a short four weeks now so we won’t be as fit and as well-prepared as I’d like to be but we’re going to be in good shape and it’s an exciting tournament. SUNsports: we need to get into that top four again? Ben: Yes. Gold Coast, the first goal must be semifinal finish at least. If we can start well there, that gives us a good draw for Dubai and obviously we’re going to Dubai as the holders so that’s the next thing. That’s a huge one and we’ll do everything we can to defend our title there. SUNsports: What do you think has been wrong with Fijian players in taking so much time to bounce back after winning a tournament? Ben: I think a lot of people can be negative but we need to look at it positively. We have pretty strong tournaments and if you look at the last two tournaments we were third and fourth. The one before, we were first and third. We’ve had some consistency now and it’s tough winning back to back tournaments. I think New Zealand and South Africa are the only two teams in the world that have won back to back tournaments. That’s the goal for me personally. Fiji has never ever done it but there is no reason why this is not the time this year or next year that we should succeed in doing that. SUNsports: So the goal and job this year is to get in the top four? Ben: Has to be. We’re all dreaming of gold medal but none of that will happen if we don’t get in the top four. So it’s very, very important and I hope everyone understands how important that is. We’re so grateful for all the support and hopefully we’ll have the finances to be able to program effectively and the boys can just concentrate on rugby. SUNsports: So Fiji rugby has a consortium of sponsors. I think we have good sponsors who are coming in to back Fiji rugby now. Ben: From my point of view, I just need to make sure that we don’t have to worry about being able to train when we want to, prepare how we want to, and make sure the boys can just concentrate on rugby. So we know that we’ve got a bit of work to do on getting more money and more revenue streams into the union. If you know any millionaires or billionaires that want to give us any money, I can give you my number. But otherwise, we’re in good shape. SUNsports: Anything you miss about England now that you’re in Fiji? Ben: I miss friends and family. But I love Fiji. My wife and I are settled here and we feel like it’s our home. But it’s always friends and family that you miss. I love my home city of London but I’ll be back there. I’m loving living in Fiji. It’s such a beautiful country with amazing people.